Pop the question and say "I Love You" with this 3-Stone Black & White Diamond Engagement Ring in 14K White Gold. 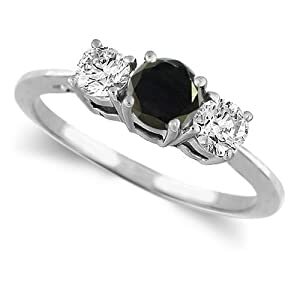 This stunning ring features natural-treated stones - 2 white diamonds and a black diamond in a 4-prong setting. And just like all other black diamond jewelry, this ring provides a clever mixtire of both a conventional and a unique vibe. Easy on the eye and great value! Make sure you get a YES with this beautiful and stylish engagement ring. See more great options for superb Black Diamond Engagement Rings. Join in and write your own page! It's easy to do. How? Simply click here to return to Black Diamond Engagement Rings.